Great with casual shorts, slacks and jeans. These Full-Grain Nubuck leather belts are extremely durable, scratch and water resistant. 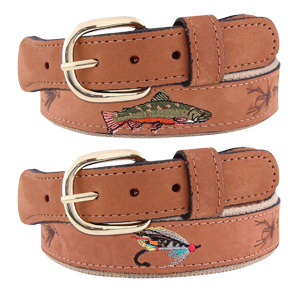 Embroidered profile of a Brook Trout or Silver Doctor Fly and 3 embossed fies repeat. Solid brass buckle and 100% nonshrink 11/4" buff colored cotton webbing. Sizes 24 - 46" waist.